The process of HRP is entirely based on the corporate plans and objectives. HRP is a continuous process of review, control and assessment. Figure clearly indicates the HRP process. Human resources planning is the process by which management ensures that it has the right personnel, who are capable of completing those tasks that help the organization reach its objectives. It involves the forecasting of human resources needs and the projected matching of individuals with expected vacancies. What new technologies are operating and how will these affect the work system? What is the volume of the business likely to be in the next five to 10 years? What is the employee turnover rate, and how much, if any is avoidable? How many senior managers will we need during this time period? What types of workers will we need, and how many? Are there people with adequate computer skills available for meeting our projected needs? What administrative personnel, technicians and secretaries will we need to support the additional managers and workers? Define the jobs and skills needed in some detail. Hire and train recruiters to look for the specified skills. Providing new training for existing employees. Developing job descriptions, performance standards and appraisals. Thus, human resource planning is a process which determines how an organisation should move from its current manpower/human resources position to its desired manpower/human resources position. Human resource planning can be defined as the process of identifying the number of people required by an organization in terms of quantity and quality. 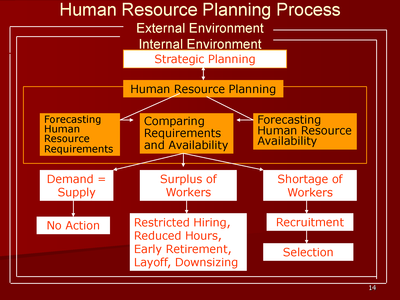 All human resource management activities start with human resource planning. So we can say that human resource planning is the principle/primary activity of human resource management. The process of HRP involves various steps they can be explained with the help of the following diagram. This is the very first step in HRP process. Here the HRP department finds out department wise requirements of people for the company. The requirement consists of number of people required as well as qualification they must possess. In this step, HR department finds out how many people are actually available in the departments of the company. The supply involves/includes number of people along with their qualification. No difference :-It is possible that personnel requirement = personnel supplied. In this case there is no difference. Hence no change is required. When the supply of personnel is more than the requirement, we have personnel surplus. We require 100 people, but have 125 people. That is we have a surplus of 25 people. Since extra employees increase expenditure of company the company must try to remove excess staff by following methods. When supply is less than the requirement, we have personnel shortage. We require 100 people; we have only 75 i.e. we are short of 25 people. In such case the HR department can adopt methods like Overtime, Recruitment, Sub-contracting to obtain new employee.